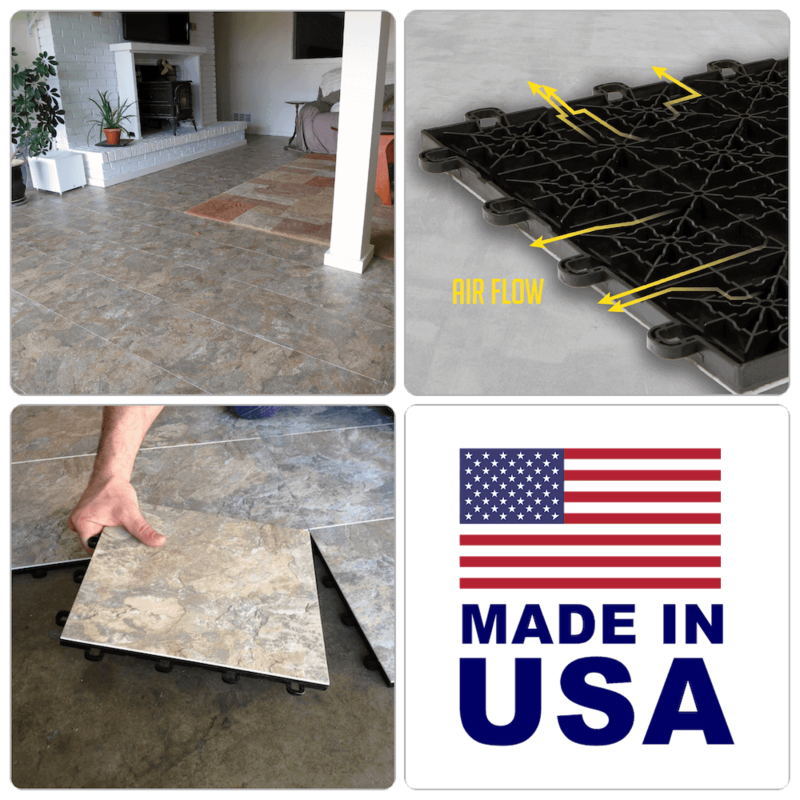 ModuTile is happy to introduce our Made in the USA interlocking basement floor tiles, which are completely engineered as a DIY (Do-It-Yourself) product. You can install the flooring yourself or have a handyman help with the project. Installation does not require the use of expensive floor contractors. 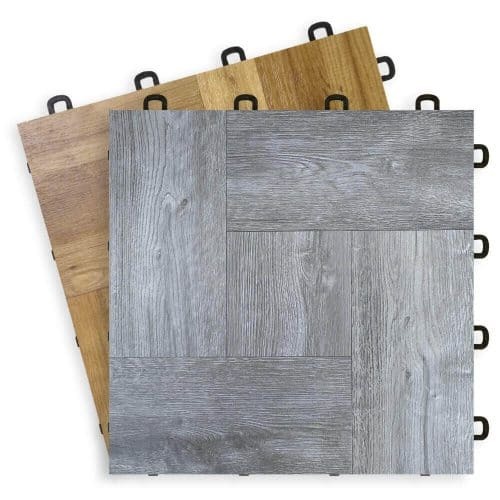 The basement floor tiles are designed to interlock using a loop-to-peg system and can be assembled without messy chemicals, glues, grouting or nails. They are designed to float directly on top of your basement concrete. 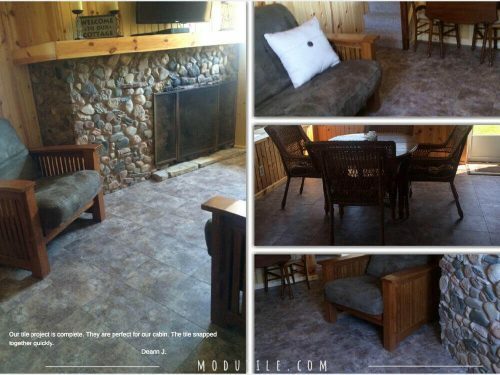 ModuTile has various style options that will fit your basement wall color scheme and decor. In the past, many homeowners attempted to install wood flooring or laminate wood floors only to have mold issues within a few months after installation. That problem is now solved with our multi-layered Wood Look interlocking basement floor tiles. They provide you with a high quality wood look without the issues of organic materials. For those of you that prefer a natural stone floor look, we have several options as well. Below you will find all our basement flooring options that are suitable for basements. Please click your preferred style to see volume discounts. Don’t pay more for less product! 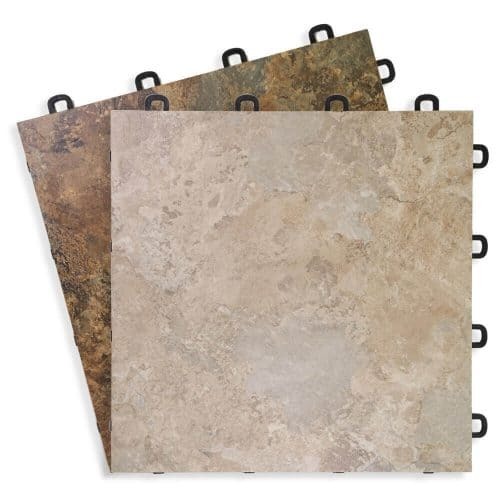 Please be sure to order your interlocking basement floor tile samples before placing your order. Monitor colors vary dramatically by brand and lighting environment you’re in. Visit our basement floor gallery page to see different customer installations. ModuTile interlocking basement floor tiles are easy to install. They interlock with one another using a loop-to-peg locking system and they are designed to float on top of the concrete base. You do not need to glue, nail, screw or fasten down. 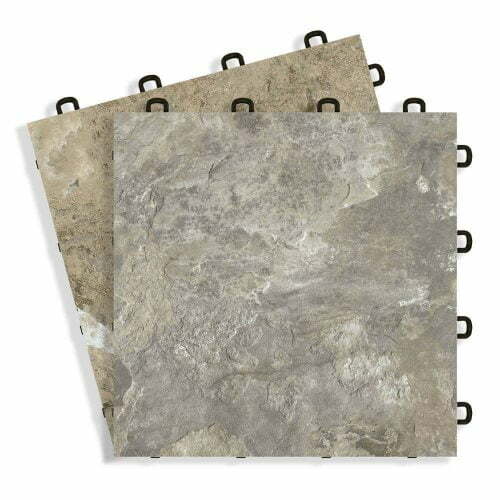 Visit our basement floor tile installation page for more information. Subfloor Basement Tiles are designed to create a floating underlayment base providing a barrier separating the concrete and the finished floor. Intended to be used in residential basements, this tile sub-floor protects wood planks or other engineered flooring from potential moisture damage. Visit our grown Basement Floor Tile question and answer page to learn more. 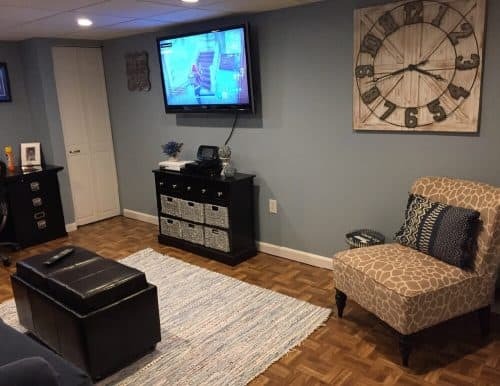 You are sure to find the perfect look for your basement. 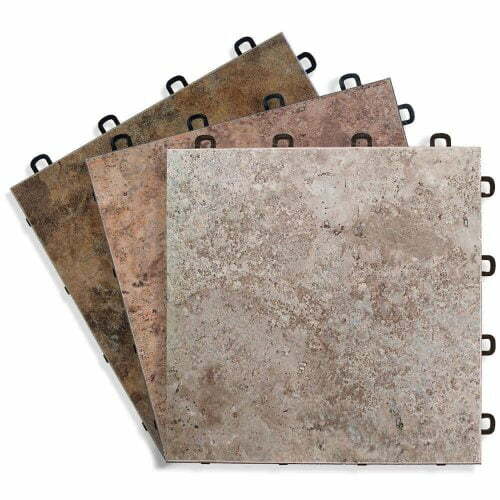 All basement interlocking floor tiles feature a mold-resistant grid structure. We have many different looks available, such as slate, marble, sandstone, and wood. All options are durable and strong enough to support heavy furniture. 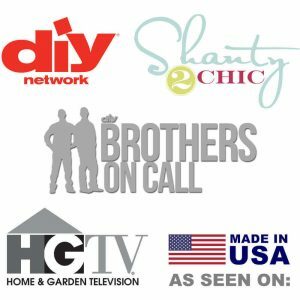 Do-it-yourself has never been easier! 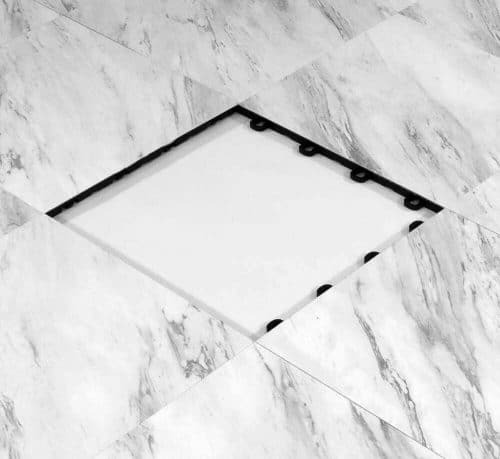 The grid structure creates a floating floor with an air gap between the underlying concrete and the top surface of the tile to allow moisture to escape from underneath the tiles. DIY Installation, no special tools or chemicals are required. As an added benefit to the grid construction, the basement flooring will act as a thermal barrier. The basement tiles are 1/2 inch thick with a good air flow grid structure. Many design options to fit your budget and design color needs. ModuTile’s interlocking basement floor tiles are designed to interlock using a loop-to-peg system. They easily snap together without the use of tools. Our interlocking tiles do not need to be glued, nailed, grouted or painted. They are designed as a floating floor that sits directly on top of the concrete. The only preparation needed is sweeping to remove debris. The tiles can be installed on top of slightly uneven floor (1/4 inch for every 10 square ft). The basement tiles can be cut using a saw with a fine tooth blade. When cutting, we use an electric jigsaw as it is the easiest and most affordable way to cut the tiles. Our interlocking basement floor tiles do not attempt to block the water vapor from rising. Instead, they were designed so the vapor escapes into the room to prevent moisture from building underneath the basement tiles. In other words, ModuTile’s basement flooring is specifically designed to breathe into the room. This design follows the US Department of Energy Best Practices. 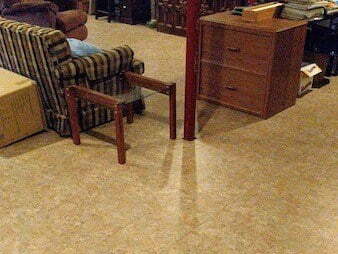 To learn more, please visit our “Basement Floor Tile Questions” page. 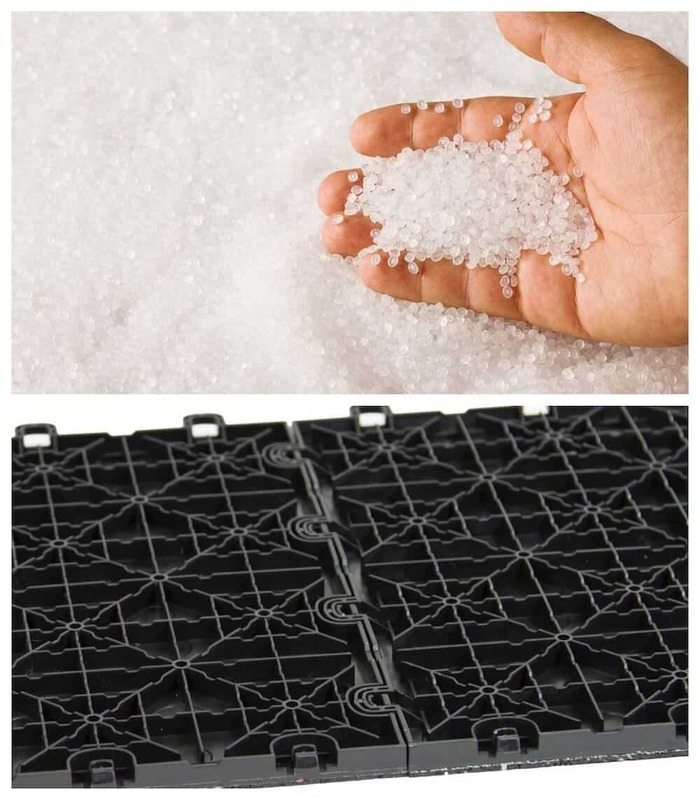 The bottom section of the interlocking basement tile is made out of a non-porous material (high-impact polypropylene plastic) that prevents water absorption. It is a high strength material that will support heavy weights without breaking. 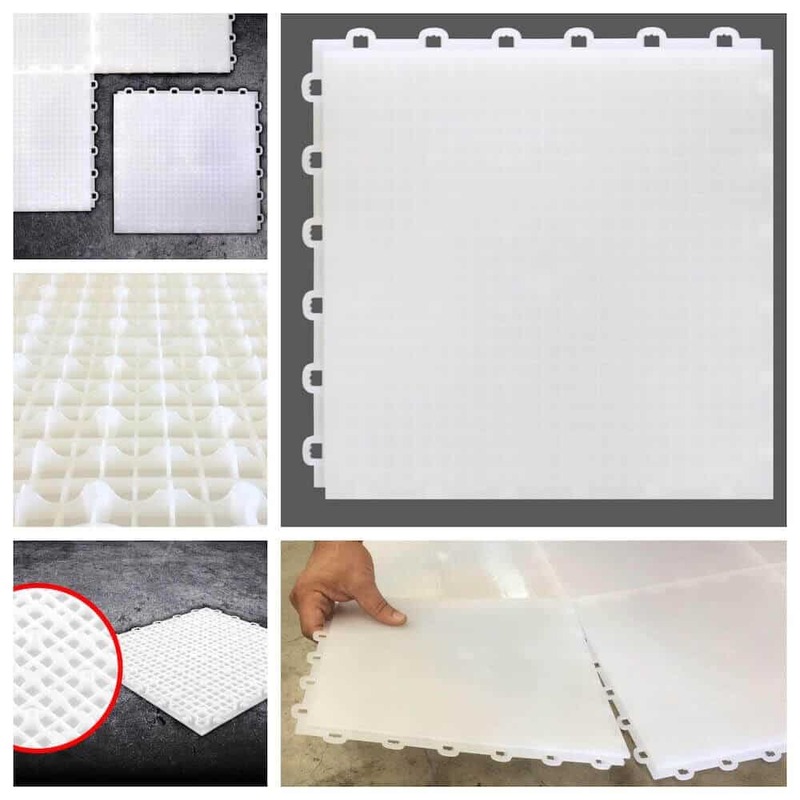 In fact, this is the same material used for the interlocking garage floor tiles which are designed to hold large vehicles such as SUVs and large trucks. ModuTile’s basement floor tiles use 100% waterproof, non-absorbent and inorganic materials as part of its construction. The underside of the interlocking basement tiles are constructed with a grid to allow airflow. In addition, once installed, the basement floor will allow air to flow upward through the gaps between tiles. Again, this design follows the US Department of Energy best practices. The improper use of vapor barriers can compound any mold problems that your basement may already have. One of the first questions people ask us is why our basement flooring is so much cheaper than others in the market. The answer is simple. We are the USA manufacturer for all our tiles and sell directly to you via the web or phone. This product is designed to be installed by the homeowner or a handyman that has no technical expertise. When you buy from ModuTile.com, you are buying directly from the manufacturer. We do not use middle men or third-party sellers as that would only raise the price. 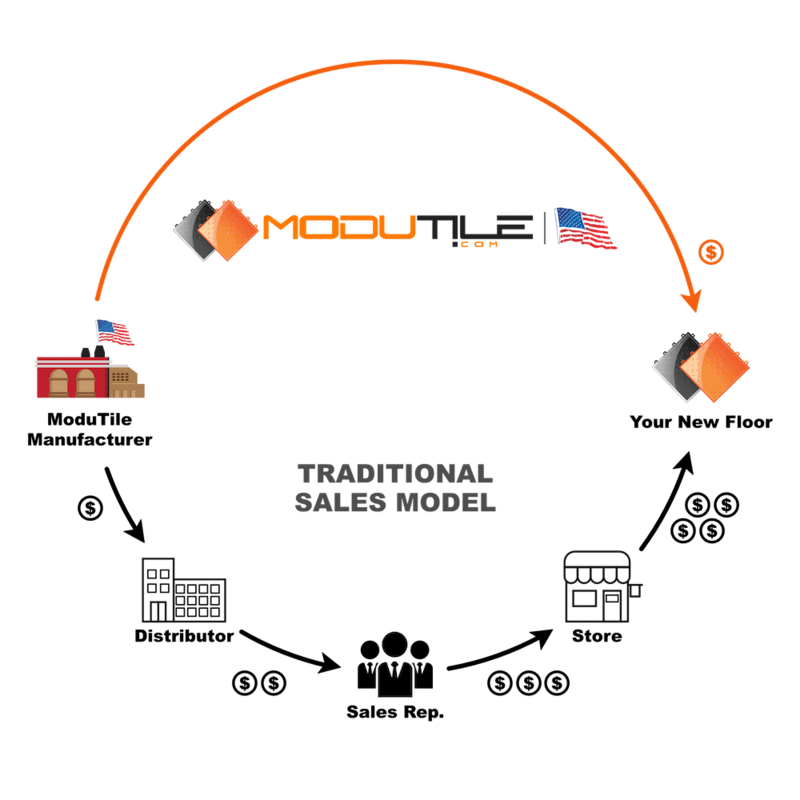 ModuTile believes in providing the most affordable prices at all times and not playing around with discounts during certain times of the year. We have ongoing discounts that are directly associated with our current material costs. In addition, when possible, we pass on the savings we get from shipping. You may notice that many of our tiles have volume discounts. Those discounts are directly associated with our FedEx and LTL shipping weight discounts. Visit ModuTile’s modular product section to choose from various colors and designs. Just wanted to let your company know how happy we are with our tiles! We searched EVERYWHERE for something like these, but the price was either astronomical or the reviews were subpar. We finally stumbled on ModuTile and we are so glad we did! You can see how ugly our basement was before, definitely not a place we would want to use for a playroom. But after some paint and the new floor the whole family just loves it. While you can still feel the varying levels of the underfloor, it really did a great job masking it more than I expected; and no tiles have popped apart which was a big concern. We have already recommended ModuTile to friends and have received so many compliments. From a family of young kids, thank you for helping us reclaim our living room and giving toys a place to go!!! Your basement floor tile questions, answered. What is the proper way to clean and care for the vinyl top basement floor tiles? Although these tiles are stain, slip, and mold resistant, it is important to maintain proper upkeep by cleaning them regularly. To clean minor messes such as dirt, dust, small water spills, etc., the debris can simply be swept or wiped away with a broom or mop. You can also use Swiffer products (i.e. the SweeperVac, Duster, or WetJet). For harder-to-remove stains, such as shoe skid marks or greasy spills, you may use warm soapy water or a degreaser such as Goo-Gone or Zep. These products have been successfully tested on the tiles with favorable results. When large spills occur, we recommend disassembling the tiles with a putty knife (carefully). Then, sweep or mop your concrete sub-floor of any stains, liquid, or debris that may have crept its way between the edges of your interlocking basement floor tiles. How do these basement tiles perform in a wet basement? The basement tiles are engineered to be resistant to humidity and moisture. They are best suited humid or dry basements. These basement tiles are not appropriate for areas that receive a frequent water exposure. If your basement has continual water flow, we recommend that you fix the issue prior to using any interlocking flooring. Leaving the tiles submerged under water will cause damage. If you have a large water leak after a storm or pipe burst, we recommend that you remove the tiles from the affected area and clean the sub-floor. Can these tiles withstand heavy weights without getting damaged or dented? 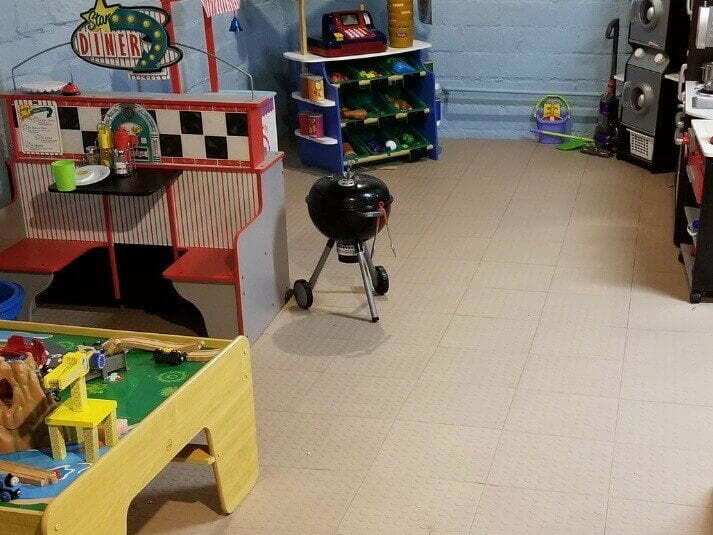 All of our interlocking basement floor tiles are constructed with a high impact polypropylene plastic base and a durable VLT (vinyl luxury top). Their material and structure are designed to support heavy weights such as pool tables, couches, and other furnishings commonly found in a residential basement. However, be careful not to drag furniture across the tiles as it may cause damage to the edges and surface of the basement tiles. Installation is a simple process. 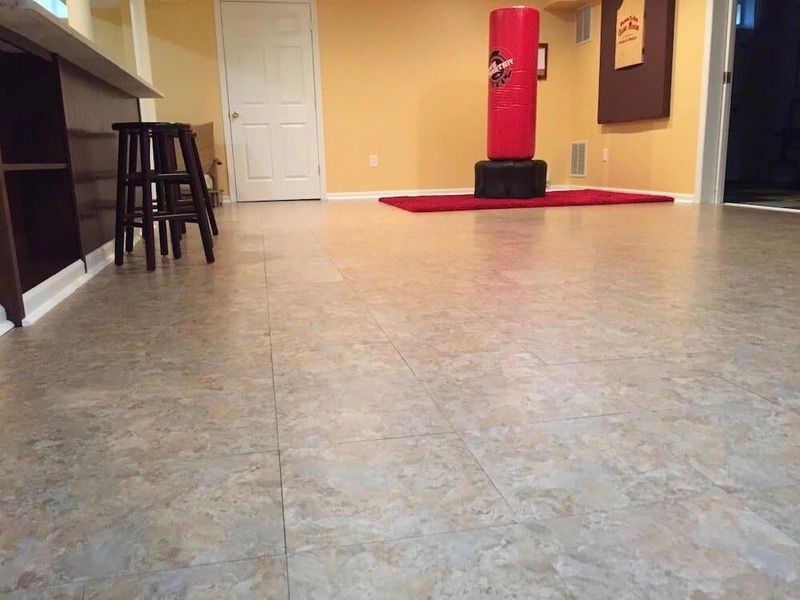 By aligning the tiles correctly and snapping them together with your hand or mallet, your entire basement floor can be completed in a matter of hours. Remember that these interlocking tiles are modular in nature, so they can connect evenly, regardless of whether they’re aligned correctly or not. It is important to align the loops and pegs correctly as this will allow them to snap together easily and speed up your installation process. For a more in-depth discussion, please see our Basement Floor Tile Installation Guide. Most basement floor tile installations do not require edging because the tiles are installed wall-to-wall. We do make ramp edging for the 12″ interlocking tiles and ramp edging for the 18″ interlocking PVC tiles. In most cases, you would use traditional T-Molding or Reducer Molding floor transition strips found and your local hardware store.